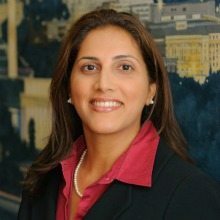 WashingtonExec recently had the opportunity to interview Geeta Nayyar, Chief Medical Information Officer (CMIO) at AT&T. We asked Nayyar, who still practices and teaches Rheumatology at George Washington University, her thoughts on Mhealth as well as telehealth. Nayyar also spoke about the changing relationship between doctor and patient thanks to social media, as well as the future of portable healthcare. WashingtonExec: Could you tell us how your new role is going and what a typical day looks like for you? Geeta Nayyar: So far my role has been exciting. AT&T has sold technology and communications solutions into healthcare for decades and in late 2010 launched AT&T ForHealthSM, a practice area that will accelerate the delivery of innovative wireless, cloud-based and networking services and applications to help the healthcare industry improve patient care and reduce costs. It has been challenging in that our practice area is still relatively new; we are about a year and a half old. The perspective that I bring is as a practicing provider on all things healthcare; whether it is evidence based medicine, health outcomes disease, is really helping enhance our strategy going forward. WashingtonExec: How do you think mobility or “mhealth” has changed your role or the role of healthcare IT in the US and around the world? Geeta Nayyar: I think one of the biggest advantages that mobile health brings to us is this idea of being able to go from “just in case care” to “just in time care” for patients. For example, as a provider when seeing a diabetic patient, one would typically follow a clinical standard of bringing a diabetic patient back for follow up visits every six to eight weeks. The reality right now is that I don’t have any insights into what happens to that patient when they go home. I don’t actually know if they need to come back in six to eight weeks, or in two weeks. I think the beauty of mobile health is that you are able to really have that insight into what is happening with that patient at home and really be able to bridge that gap as it exists today. I really like the potential that the mobile health aspect of IT creates for us. It’s the ability to really give patients access to care when and where they need it, potentially averting unnecessary hospitalizations, emergency room visits etc…all of course driving to improved outcomes with much less financial and health costs to the patient and system overall. WashingtonExec: How drastic has the change been throughout your career in the way people view open data and mobility in the healthcare industry? Geeta Nayyar: Right now we really have the perfect storm of policy making to really support health IT adoption and technology such as mobile health and telehealth. Partly I think just due to the change in culture, change in generations… we now have the doctors and medical students of today that all have mobile devices and use social media tools. This idea of open data is not a foreign concept and I think the same goes for consumers and patients – they are more willing to entertain this idea in a way that hasn’t been done so in the past. The whole list of stakeholders has really embraced a lot of these technologies in a way that wasn’t there twenty or thirty years ago. I think there is a definitely a paradigm shift happening, slowly but surely. WashingtonExec: What do you think is the next big thing for healthcare IT? Geeta Nayyar: There is no doubt that it is about portable healthcare. People want to be able to take their healthcare wherever they are. They want to be able to access their data and it has to be easy and intuitive. The only way of doing this is to be sure that all of these technologies are clinically integrated. As we talked about all of the different technologies that are out there it is really clear that they need to be able to connect. This idea of connectivity is really going to be the foundation of improvements in health technology. The real value in data in not simply collecting it, but in connecting it. WashingtonExec: What is the biggest challenge you face as a healthcare executive or as a doctor? Geeta Nayyar: It is unfortunate that the actual practicing of medicine is easier than the coordinating or communicating of care for patients, which ultimately does affect the way doctors practice. For example, for me, it is much easier to come up with the diagnosis and the treatment plan for a patient, than it is to get access to my patient’s data that comes from three different specialists at three different medical centers. It is not nearly as seamless as it could be and so when I think about where AT&T is going to fit into this, our ability to connect all these data points is a very necessary value proposition in today’s market. Certainly there are all kinds of gaps in care that exist today and all kinds of challenges in the healthcare system that technology certainly can’t solve, but I think these more fundamental challenges can be filled by the solutions that we offer. WashingtonExec: What is something people might not know about you? Geeta Nayyar: I think probably that I just took on my newest role as a new mom. My daughter was born a few months ago and I’m quickly learning that it is going to be the biggest role I’ve ever taken on. I’m looking forward to motherhood. WashingtonExec: I read that you still see patients, is that right? Geeta Nayyar: Yes, I still do practice. I am on faculty at George Washington University and I practice and teach Rheumatology part time. WashingtonExec: Why do you think being involved in organizations besides your current day job is important? Geeta Nayyar: It is important in terms of understanding the different perspectives and stakeholders’ views on what’s happening in the industry today. Overall, it helps me to have a more holistic view of healthcare by serving on different industry committees and organizations. WashingtonExec: Who do you admire either personally or professionally? Who inspires you? Geeta Nayyar: I would definitely say on a personal level that I would have to say my husband. He immigrated to the United States when he was in his early 20’s. He is very much a self-made man. He has always astounded me with his intellect and his ability to achieve but most recently with how easily he stepped into fatherhood. He is certainly way ahead of me. She is definitely a daddy’s girl; even at 3 months old! Professionally, I would say the CEO of PepsiCo, Indra Nooyi. She is an incredibly successful Indian-born business executive that has accomplished and contributed a great deal in her life. She is an inspirational leader and I hope to meet her someday.